With the holidays around the corner, celebrations and family gatherings are on the way. Making the home beautiful, fresh and welcoming for guests can be accomplished with plants that bloom. The eyes love color and the brain itself is stimulated and uplifts the mood. We picked 4 wonderful blooming plants to bring color home and set the right atmosphere for a memorable gathering of friends or family. Begonias can be grown indoors in pots for splash of color. This genus contains 1,795 different plant species! Which translates to a wonderful array of flowering plants with white, pink, scarlet, or yellow blooms in numerous hybrids and variations. 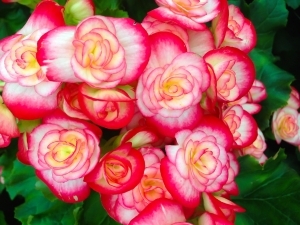 Begonias are native to Mexico, Central and South America, Asia and South Africa. Begonia was coined by Charles Plumier, a French patron of botany, in honor of Michel Bégon, a former governor of the French colony of Saint-Domingue which is now known as Haiti. The first begonia was brought to England in 1777 after it was first found in Costa Rica and then prepared for commercial cultivation. All varieties have a yellow eye as its center and grow compact dense foliage that reaches 6 – 9 inches in height. Many different types will grow blooms all throughout the year. Though grown outdoors, these tough and undemanding plants do well indoors and bring a wonderful cheeriness and color inside the home or office. 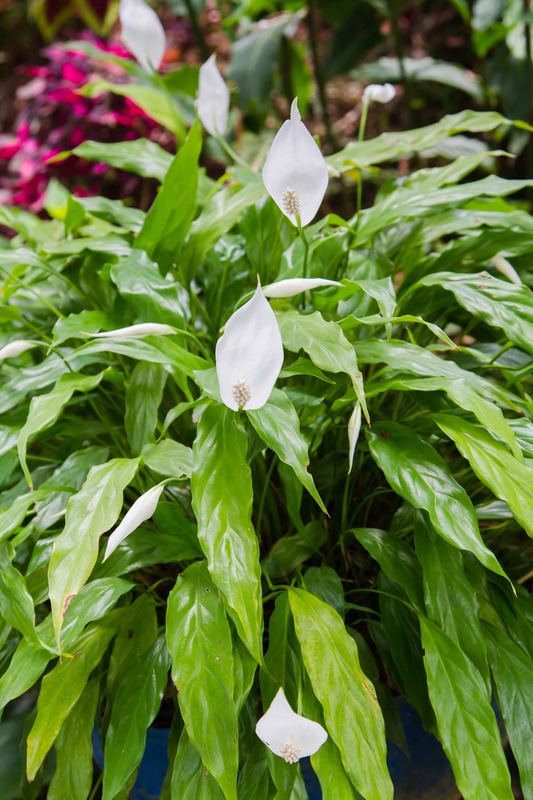 Though showy with beautiful white flowers, the peace lily is also a great air purifier. 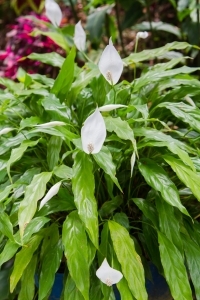 Graceful stems on a peace lily hold a beautiful white bract that enfolds the white or pale yellow flowering part of the plant. Green glossy leaves surround the flowers and brings a fashionable look to any decor. The flowers typically appear in the late summer and last for weeks. The popular name comes from the way the flower soars above the leaves like a white flag. 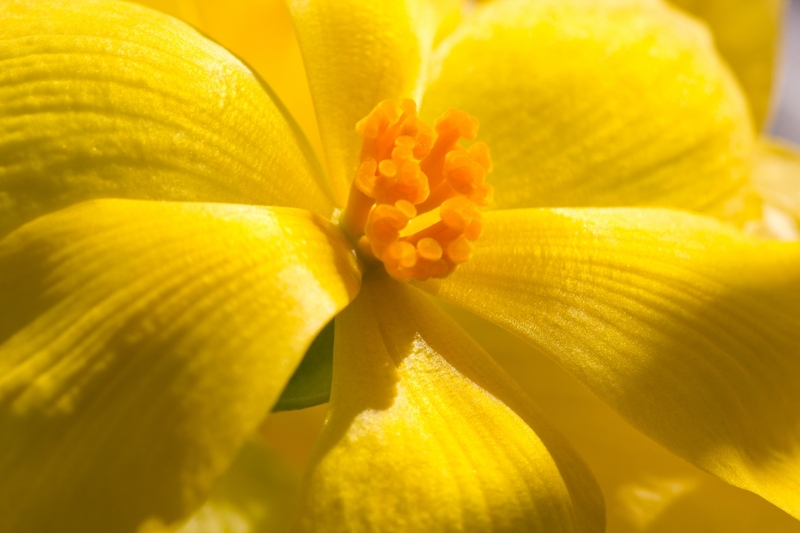 They prefer filtered light and do well in low light conditions but flower best in brighter light. Peace lilies are also great air purifiers. They are known to remove toxic chemicals such as methyl, acetone, toluene, benzene and ammonia from the environment by trapping the chemical in leaf pores and breaking them down. Typically a living room size space would require 10-12 peace lilies to purify a room. Whether they are peace lilies or other household foliage, air is always enhanced by plants and can keep a room fresh and alive with added oxygen. Orchids are simply amazing. There are about 28,000 currently accepted species and just about equals the number of bony fishes; twice the number of bird species; and about four times the number of mammal species. And they make up approximately 6 – 11% of all seed plants. Orchid flowers come in hundreds of different shapes and sizes, from very tiny to very large blooms. The graceful orchid is delightful addition to any indoor space. And there are dozens of colors to choose from in a full spectrum of colors with many orchids combining colors for bi-colored shades. There are orchids in shades of very soft pink to very deep magenta. Several types of orchids bloom in shades of yellow and are more rare than some of the other colors. The dramatic effect of orchids in shades of reds is spectacular. They also come in white and these species typically are pollinated by nocturnal animals or insects since white is the most eye-catching color at night. And white orchids normally are very fragrant during the nighttime hours to entice pollinators in the dark. Some hybrid flowers come in very attractive shades of green or are highlighted in green. Naturally colored blue orchids are very difficult to locate. This has led to the popularity of dying orchid blooms blue. Future blooms will return to their natural color. Long thin strappy leaves surround the colorful bracts for a showy display in a covered patio or inside a home. A plant that was often seen as incompatible in an indoor environment, the bromeliad is a wonderful plant for color. Recognized for gorgeous flower displays in an abundance of colors, shapes and textures, the bromeliad is easily adapted to the indoors for the home or business. The long strappy leaves of the bromeliad is also showy in a variety of colors: red, green, purple, orange, yellow, banded, stripes, spots and other combinations. A mature plant sends up a flower spike with small flowers surrounded by showy, often colorful, bracts (often incorrectly referred to as the flower itself). They can last for months, but once the flower bract dies, so eventually will the plant. But the mother plant actually multiplies by sending up offsets, commonly called pups. Once the pups begin to have roots and form a central cup, they can be carefully cut off with sterile scissors and placed in its own pot. 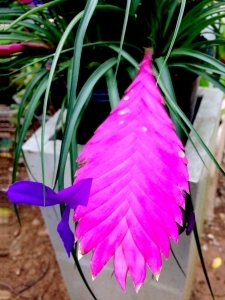 There are many subfamilies such as pineapples and Spanish moss, both types of bromeliads. When grown in pots with rich, fast-draining potting soil, this compliant plant quickly adapts to its environments though it is native of the tropical rainforest. When grown indoors, the central cup where the foliage grows out in rosettes does not need to be filled with water. In its natural environment, water pools in the cup to provide moisture and nutrients. But in a pot it receives its food through roots and leaves, but does not like to rest in standing water. The different genera of bromeliads provides a good selection of different types that have different lighting needs. Some can withstand full sun, but most prefer well-lit, bright indirect lighting. The gorgeous showy plant makes the bromeliad a great addition to bloom up the indoors with color.